These coconut caramel haystacks (aka vegan macaroons) are the perfect chocolate–dipped treat for coconut lovers. Do you play favorites when it comes to certain ingredients? I admit it, I do. If you’re anything like me your pantry or fridge is never without at least a few favorite staples. Take for example chocolate or coconut, you’ll never find me without at least one of the two on hand. Chocolate and I are old friends and meet up at least once a day and coconut is never far behind. I think it goes without saying that chocolate and coconut play well together, ask any Mounds lover and they’ll agree. 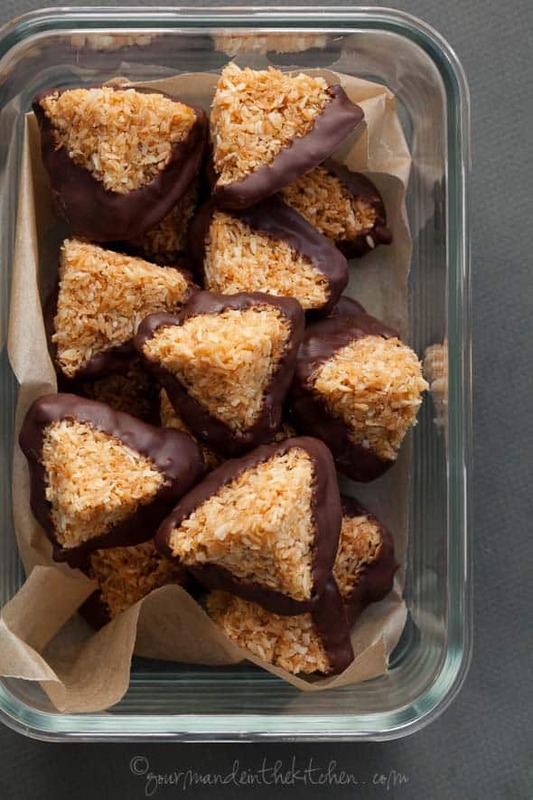 These little coconut pyramids take that tried and true combination and introduce caramel to the mix. 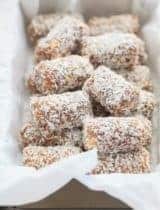 Little haystacks of shredded coconut are bound together with a quick coconut nectar caramel that’s accented with a hint of vanilla and a pinch of sea salt. 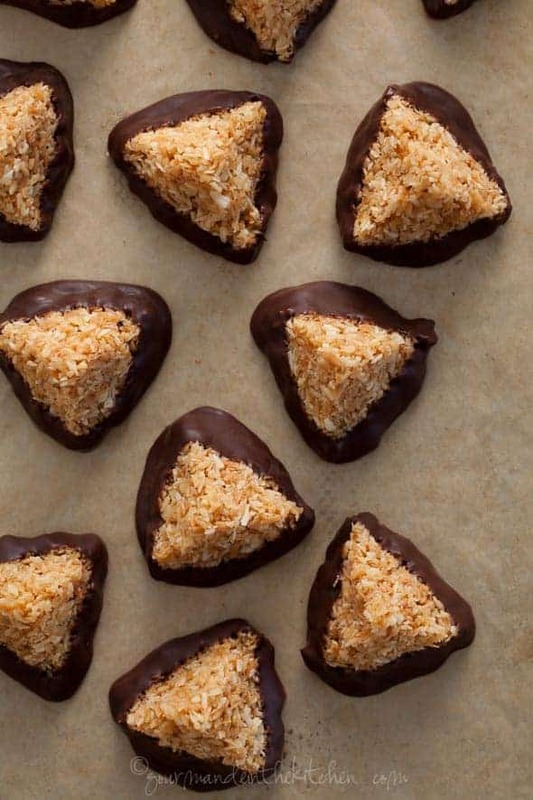 The shreds of coconut are first lightly browned in the oven to bring out their toasty flavor then coated in caramel before being shaped into pyramids. 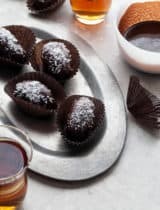 What you end up with are firm little mounds of coconut accented with just a touch of caramel-like flavor, that’s similar to a macaroon, but inherently free of gluten, dairy and eggs, which make them great for gatherings where you need to serve a sweet treat that fits with everyone’s dietary needs. Now of course you don’t have to dip them in chocolate, but if you have a few bars of chocolate lying around I highly recommend that you do. 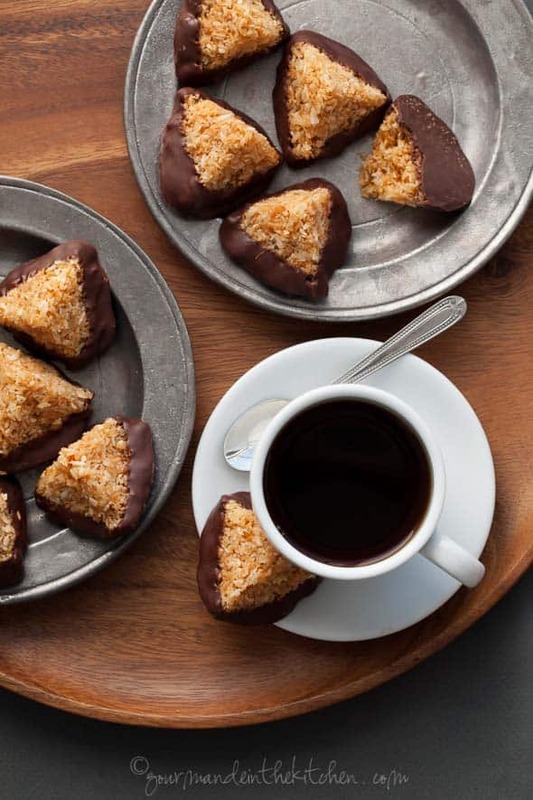 I love the slight bitterness of dark chocolate against the sweetness of the caramelized coconut haystacks. 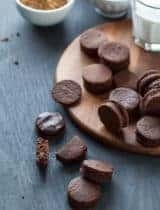 I often find myself starting at the bottom, nibbling at the bottom chocolate dipped edges first, then working my way up. Are you a chocolate and coconut lover? What are your favorite ingredients? These coconut caramel haystacks (aka vegan macaroons) are the perfect chocolate-dipped treat for coconut lovers. Preheat oven to 350° F. Spread coconut evenly on a sheet pan and toast for 3-5 minutes until lightly golden. (Don’t walk away; coconut can go from perfectly toasted to burnt in a matter of moments.) Remove from oven and set aside. Turn off heat and stir in the toasted coconut until completely coated. 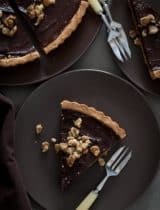 Using a small cookie dough scoop or spoon, scoop out small balls of the caramelized coconut onto a piece of parchment. Working quickly, use your hands to gently form the balls into pyramids. Set aside to cool. In the meantime, chop half the chocolate and break the other half into small pieces. Place the chopped chocolate in a heat-proof glass bowl over a saucepan of simmering water. Stir with a rubber spatula until chocolate is just melted. 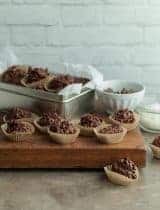 Remove bowl from heat and let cool for 2-3 minutes then add reserved un-chopped chocolate pieces and stir slowly but constantly until completely melted, smooth and thickened. Dip the bottoms of the haystacks into the melted chocolate, coating them well on all sides. Transfer onto a parchment lined sheet pan. Let sit until the chocolates have set and store in an airtight container at room temperature. 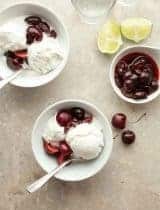 Scroll through the images below to see what I recommend for this recipe. These look amazing - love that they have caramel, they sound like even better macaroons! I definitely always have staples in my kitchen, buttermilk is actually probably one of my main ones, I just love baking with it! These look like something from my favorite bakery --- and I've never heard of coconut nectar, what a thought! You ha me at chocolate dipped. These look like a delicious treat. Hi Meeta, good to hear from you. Yes all is well and motherhood is wonderful. I only wish time wasn't flying by so fast, she's already so big, I want her to stay my little baby forever! These little haystacks are so cute. Perfect for Passover, too!! These are gorgeous and they look so yummy! 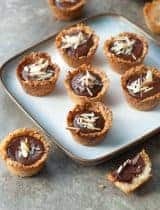 Chocolate and Coconut are staples in my pantry too! I will be making time to make a batch this afternoon! Whoa baby! Gimme some of that sweet sweet deliciousness! I love that you used coconut nectar! I need to go buy some now! I keep meaning to make haystacks but never do! Maybe this is the motivation I need! Chocolate and coconut are undeniably meant for each other. These looks like such delectable little treats! I have actually never used coconut nectar before. You inspired me to try it! Is there another kind of sweetener I could use? Maybe maple syrup? Hi Sam, Yes you can use maple syrup instead but it won't have quite the same caramel-like flavor as the coconut nectar does. Went on a trip to the local farmer's market in Maui a couple months back and was offered a chocolate dipped coconut macaroon made with fresh coconut and it was the BEST thing I tasted for the entire trip so I can only imagine how amazing this must taste!! These look amazing! Coconut and chocolate are the BEST together! Coconut nectar is a liquid sweetener made from coconut sap. It's similar in taste to brown sugar with a hint of caramel flavor.